New York artist Ken Weathersby both reiterates and expands attempts to deconstruct the identity of the painting and, in particular, undermine the privilege traditionally ascribed to surface alone. 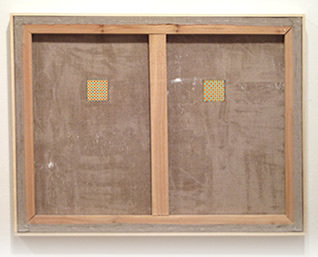 Cutting away sections of canvas to reveal the stretcher, or simply turning works 'backwards' to specifically focus on this normally hidden structure, Weathersby's interventions are similar to those practiced by other artists featured here. 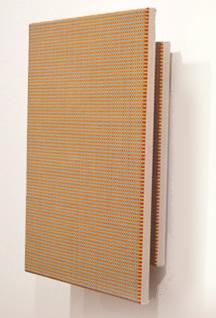 Nevertheless, Weathersby brings a particular rigour to this enterprise, concentrating, in the works shown, on serial variations to canvases that are identically marked with a fine grid pattern. 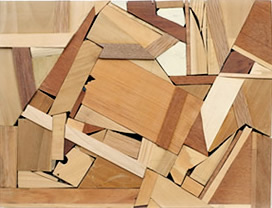 Thus emphasising the fact that pictorial surface is only partially of interest - or, at least, a single component in a larger artistic endeavour - Weathersby forensically dissects the painting as object, turning sections front to back, exploring its innards, or describing potential for sculptural arrangement in which its entire form becomes relevant. 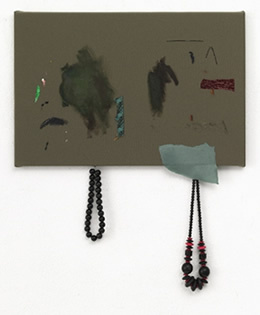 It's perhaps hard to decide which of these constructions is more interesting: the wall-mounted bricolages created by this young African-American artist, or the fact that Donelle Woolford is herself a construct; an 'avatar' devised by maverick artist Joe Scanlon and brought to life by various actresses. Whatever the case, Donelle Woolford/Joe Scanlon's work is becoming increasingly popular, and while only marginally representative of the specific concerns pursued by other artists here, it does, of course, harbour its own conceptual agenda. Aptly reminiscent of the pieces of a jigsaw puzzle, the enquiry underpinning these pieces is not so much the identity of painting, but the identity of the artist behind them. Yoking the well-trammelled themes of authorship and authenticity to a surging interest in the construction of the painting, the life and works of Donelle Woolford make for a timely endeavour. For several years, Dutch artist van den Hurk has created works that reflect his notion of a critical juncture in contemporary painting: "the end of its logical conclusion; where images can no longer support any meaning." However seriously one takes this view (which is upheld by many besides van den Hurk) it's certainly true that the artist's work is oddly destabilising, stubbornly resisting attempts to reveal anything beyond the sum of its parts. A necklace or length of fabric suspended from a canvas - both favourite devices - eschew clear-cut significance; instead, their nigglingly awkward presence fractures illusions of self-contained pictorial space while failing (arguably) to enhance composition. 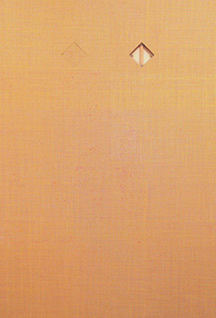 Indeed, van den Hurk's characteristic extensions to the picture plane provide visual trails that lead nowhere, or simply loop back on themselves, underlining his contention that "In my work I show the representation as representation, not by showing the 'what'... but by showing representation itself." Whether or not van den Hurk actually achieves this aim, his practice frequently concurs, at least in terms of outcome, with the work of other artists featured here. It's perhaps ironic, therefore, that whereas his own stance addresses a perceived impasse in painting, for others, a close examination of the painting as object invests the medium with new possibility. The works shown here by LA artist Justin Beal appear, at first, to reverse the process by which our other featured artists transform paintings into three-dimensional entities. 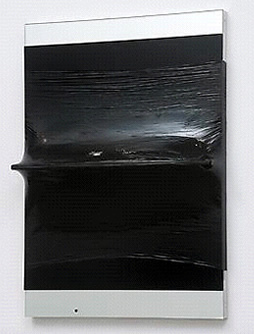 Most of his materials - mirror, plexiglass, plaster, aluminium - are already sculptural in nature, with paint applied (if at all) to a pre-constructed surface. His starting point, however, is entirely familiar - the classic, rectangular, wall-mounted platform - and much of the dynamism in these works is generated by Beal's unexpected resolution of such fundamentally orthodox spaces. 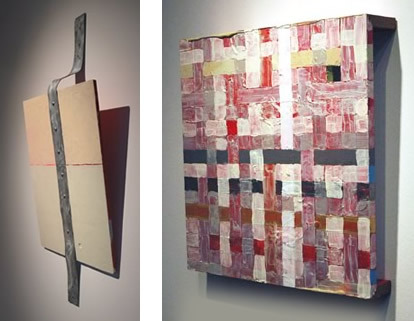 An angular wedge thrusts forward from an otherwise two-dimensional surface (left), defiantly expanding the abstraction towards the viewer. This abrupt disruption of the picture plane is echoed - more subtly - in a work which equally plays with the notion of pictorial self-containment (below). 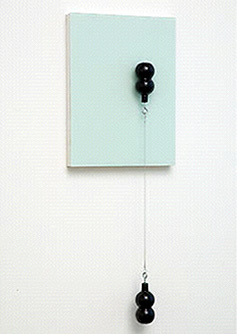 Here, the symmetry of a sculptural object attached to a minimal coloured ground confounds easy definition of the work's physical / spatial limits: does it 'end' at the panel's visible borders, or extend beyond them along with the object itself? 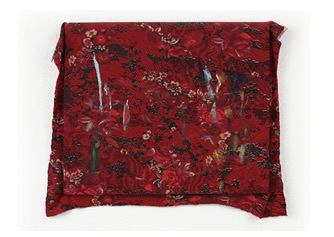 Breaking free of traditional constraints, the piece melds conceptually and visually with the wall upon which it hangs; if not entirely a sculptural painting, a work that certainly examines sculptural-painterly concerns. Austrian artist Florian Pumhösl (b. 1971) founds his practice on a critical relationship with modernism and its heritage, an interest that broadly aligns him with Florian Schmidt (above). 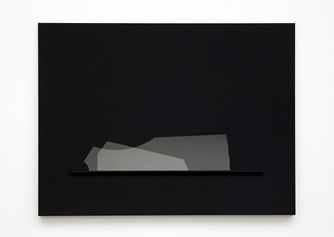 Pumhösl's Bewegliche Bühne (Movable Stage), a series begun in 2008, references constructivist aesthetics via works which are themselves quite literally constructions: black panels used as a mount for one or more pieces of cut glass. 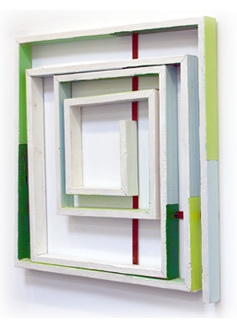 The forms within each frame are mobile, allowing for endless re-arrangement and rudimentary sculptural interaction. Negating the fixed composition of painting, these works - as their collective title implies - are envisaged as a series of flexible stage sets; a performative space for the production of abstract motifs. 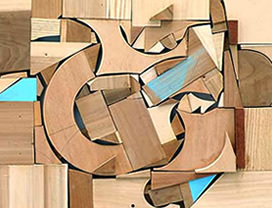 New York artist Cordy Ryman's colourful constructions delight in sculptural resolution of the picture plane using roughly hewn wood and other simple materials. The processes of facture are left entirely evident: glue oozes from crevices, and paint is applied in rapid, uneven strokes. 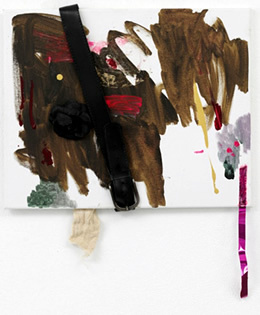 Although much of Ryman's practice simply extends a tradition of bricolage - which, like the work of Donelle Woolford (above) adds little to critical examination of painting itself - certain of his concerns reveal far more concerted enquiry. 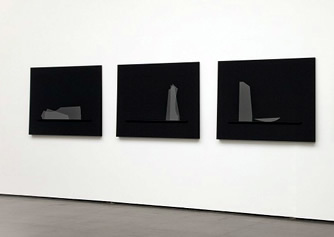 In particular, a sculptural definition of negative space - whether located within a work (above, left), or established by the nature of its fixture to a wall (below) - closely echoes growing interest in the spatial and conceptual realms a painting can inhabit; a territory where absence and even the cast of a shadow become part of the work itself. 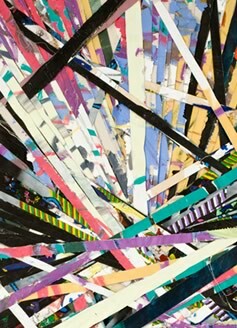 Although LA artist Matthew Chambers works in various mediums, for several years he has produced a continuing series of collage-paintings in which other paintings serve, quite literally, as the basis for his abstractions. 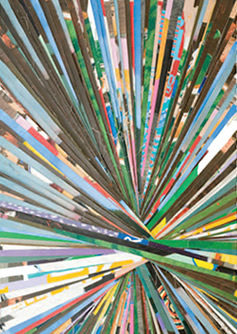 Rejected works are cut into strips, then arranged on a new canvas in a variety of designs. Through this destructive yet ultimately regenerative act, the nature of the painting as fetishistic art object is simultaneously undermined, then restored. The process of painting is likewise transmuted into a sculptural sequence of cutting and collage; and the artist's (generally) figurative works transformed into abstract fragments which in turn contribute to a larger abstract motif.